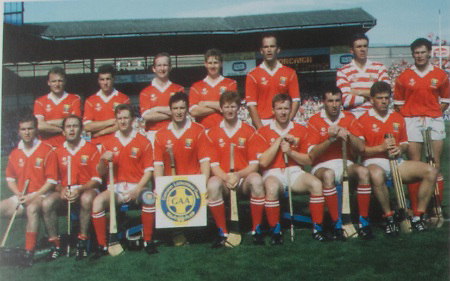 Cork-All-Ireland Hurling Champions 1990. Back Row: Teddy McCarthy, John Fitzgibbon, Sean O'Gorman, Jim Cashman, Mark Foley, Ger Cunnigham, Denis Walsh. Front Row: Tony O'Sullivan, Brendan O'Sullivan, Kieran McGuckan, Tomas Mulcahy (capt), Kevin Hennessy, Sean McCarthy, Ger Fitzgerald, John Considine.